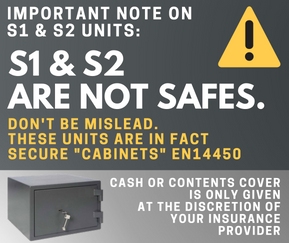 *Unlike most small grade 1 safes, this safe has enough depth to store a box file or most laptops with door closed. A certified safe must be tested to the EN1143-1 standard by a certification body with European accreditation according to ISO/IEC 17065:2012 standard in order to have a valid insurance rating. This accreditation is confirmation of competence according to ISO/IEC 17065:2012 to carry out the certification of the specific safe listed on the test certificate in accordance with the relevant European standards. 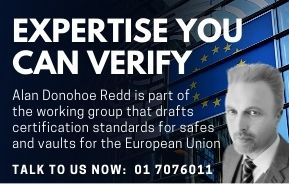 Certified Safes Ireland™ is a trading name of Certified Safes International Ltd™ one of the most professional and respected safe suppliers and installers in Europe. Certified Safes International Ltd™ is a longstanding member of The European Security Systems Association and part of the ICS Group. © 2014-2019 Certified Safes Ireland™.